A welding mask is a tool used in metalworking. The welding mask is one of the two items required before any type of metalworking can be performed, with the other being the propane torch. A welding mask can be used to construct many structures and furniture, such as metal crates and metal walls. Not only does this require a propane torch and welding mask, but each construction, will also require a certain amount of welding rods to be used. 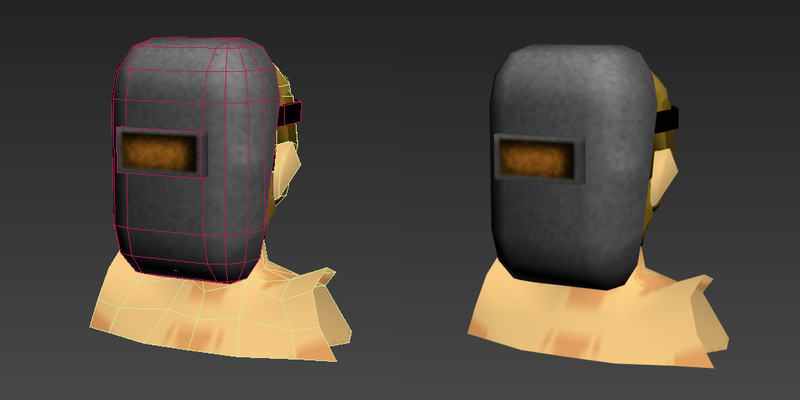 To construct metalworking objects, the player must have both the propane torch and welding mask in their inventory, then right-click and hover-over "Metalwork" in the contextual menu then select the desired structure to be constructed. Note that each metalworking object requires a known recipe that can be learnt by reading the appropriate recipe magazine. Similarly to carpentry, the player can barricade doors and windows with metal sheets or metal bars. Unlike constructing, barricading does not require any welding rods or learnt recipes. There are various metal objects throughout the world that can be disassembled, rewarding the player with some metalworking skill and metal parts. This also requires the player to have a propane torch and welding mask, however does not require welding rods. Some vehicle parts can be repaired using a welding mask and small metal sheets, so long as the player has a sufficient metalworking and mechanics skill. Parts that are currently repairable with a welding mask and small metal sheets are: doors, gas tanks and trunks. Car wrecks (burnt cars) can be dismantled, gathering metal materials depending on the player's metalworking skill. welding masks can be found in logging factories, sheds, garages, tool stores, storage units, and crates. They can be found in the trunk of a metal welder, or construction worker's vehicle. This page was last edited on 31 October 2018, at 09:39.